Job loss, divorce, illnesses, and injuries can quickly cause bills to accumulate, and suddenly you feel overwhelmed. Debt collectors keep calling, and you feel like there is nowhere to turn. If you dream of a new beginning for your financial situation in Northern Kentucky, Lawrence & Associates will help you navigate the available options that will work for you. It is possible to become debt free over a period of time using a Chapter 13 bankruptcy proceeding. Chapter 13 is a federal form of debt relief that will give you the opportunity to pay off your debts in a way that you can afford. Lawrence & Associates has helped many people, just like you, get out of the seemingly endless debt cycle. If you live in Northern Kentucky, our experienced bankruptcy attorneys will meet with you for free to review your unique situation and create a plan that will work. Together, we can work to put these financial struggles behind you and help you to realize a brighter, debt-free future. It is possible, and we’re here to help you get there. Bankruptcy proceedings can be very complex. A Chapter 13 bankruptcy will bundle all of your debts into a regular payment plan that will last a specific period of time. In order to proceed with a Chapter 13 bankruptcy, you will be required to establish that you are qualified to make your proposed payments by submitting a detailed budget to the court. The type of information needed in this budget is exacting, and a bankruptcy attorney from Lawrence & Associates is experienced in compiling this documentation in the format the courts prefer. If you try and begin this process on your own, your request may be denied by the court, which will cost you more time and money. Chapter 13 bankruptcy is a way to reorganize your debt similar to loan consolidation. You will need to categorize your debts and create a payment plan to follow over the course of 3-5 years. This is not something you should do alone. Many people make the mistake of trying to speed up the bankruptcy process thinking that it is better to get it over with. However, the only thing that this does is to set you up for more financial distress. The court may see that your proposed plan is unreasonable and reject your proceeding entirely. Or worse, you may begin payments and then find that they are unsustainable, so you wind up worse than where you began. An experienced bankruptcy attorney from Lawrence & Associates will work closely with you in your proceeding to prevent these mistakes and create a payment plan that will work for you long-term. If you are experiencing financial distress, call us today to see if a bankruptcy proceeding in Northern Kentucky may be a fit for your needs. Lawrence & Associates is dedicated to helping our clients achieve a brighter, debt-free financial future. We understand that real-life circumstances can unexpectedly cause your finances to go awry. If you are experiencing financial distress, you are likely exhausted, emotionally drained and embarrassed. However, the bankruptcy process can be completed with positivity and a bright outlook on what is to come. At Lawrence & Associates, we promise this and more. Our team of trusted legal professionals will work with respect and compassion for your situation, and we believe in doing more than just filing your proceeding. We create a strategy for your financial success, and we will be by your side every step of the way. 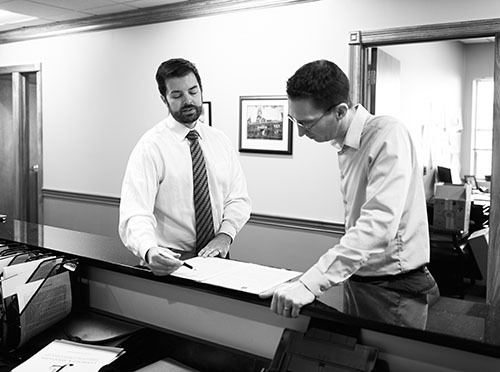 When you select Lawrence & Associates, you gain a team of legal professionals in Northern Kentucky who are trusted and respected in the legal community and by our clients. You will receive one-on-one attention from our team, which ensures that your needs will be directly met. We know that bankruptcy is a sensitive topic, and we will treat your case accordingly as we work together for a resolution. It is normal to feel scared about a bankruptcy proceeding, but Lawrence & Associates will show you how to view this situation as an important step for a brighter future. Once you talk with Lawrence & Associates about your options and decide Chapter 13 is the right fit for your needs, we can begin work on your case. Together, you and the Lawrence & Associates bankruptcy attorneys will establish your debts, assets, and earnings in detail. Then, we will work together to craft a forward plan for repayment of all debts within the next 3-5 years. Once you take a brief Credit Counseling course (in-person or online), we can file your petition for bankruptcy. Upon filing, you will be immediately protected by the Bankruptcy Code, which stops the harassing calls and letters from creditors. Early in the process, we will go to court for a hearing, where you will meet with the trustee who will handle your case. The trustee will ask you questions about your bankruptcy petition and will verify that the details you provided are accurate. After your hearing, you can move forward with your repayment plan. Each step of the way, your bankruptcy attorney from Lawrence & Associates will be available to support you, answer questions, and protect your rights. What happens if I file for Chapter 13 bankruptcy? Every case is different, but generally, once you file for Chapter 13 bankruptcy, your debt will be consolidated, and you will make regular payments over a period of time, usually 3-5 years. A bankruptcy attorney at Lawrence & Associates can review your specific scenario for free and give you a better idea of what to expect. You never pay any money up front for a bankruptcy proceeding at Lawrence & Associates. We offer affordable rates and payment plans, and your initial consultation is totally free. What will a bankruptcy attorney really do for me? An experienced bankruptcy attorney will give you legal advice specific to your situation so that you are set up for success in your bankruptcy process. This is extremely important because there is no “one size fits all” approach to bankruptcy. You will develop a close relationship with your attorney at Lawrence & Associates, and we will make sure that your unique needs are best represented in your proceeding. We are always available to answer your questions. Chapter 7 and Chapter 13 bankruptcies are designed to provide different types of relief to debtors. In most cases, you may only be eligible for one bankruptcy option After a careful review of your situation by one of our experienced bankruptcy attorneys at Lawrence & Associates , we will be able to advise you on how to proceed. If your home is in foreclosure, a Chapter 13 bankruptcy proceeding will stop the foreclosure process. However, you will need to keep making payments and ultimately catch up on missed payments in order to comply with your bankruptcy proceeding. A bankruptcy attorney at Lawrence & Associates can provide you with more detail on this topic and how it applies in your specific situation. Can Chapter 13 Bankruptcy save my car from repossession? Chapter 13 will allow you to get caught up on your car payments as part of your repayment plan so that in most cases you can keep your car. Does Chapter 13 bankruptcy discharge my debts? When you complete a repayment plan under Chapter 13 bankruptcy, you will receive a discharge that will relieve most of your remaining debt. However, this only happens after you make 3-5 years of regular payments. What debts cannot be discharged under Chapter 13? After completing your Chapter 13 repayment plan, many of your remaining debt will be relieved, or discharged. However, there are some debts that will not be discharged, including child support, spousal support, criminal penalties, student loans, and some tax debts. Chapter 13 bankruptcy can offer you the relief you need from debilitating debt so you can get your finances back on track. Call Lawrence & Associates today at (513) 351-5997 for a free session with our knowledgeable bankruptcy attorneys in Northern Kentucky and learn how we can help.